Chicago Mayor Rahm Emanuel plans to present a proposed ordinance to the City Council today which would increase the fines for a number of traffic violations both committed by and affecting bicyclists. The proposal addresses three specific issues. First, the ordinance proposes increasing the fine for bicyclists who violate traffic laws from $25 to $50-$200 depending upon the type and severity of violation. Second, under the proposed ordinance, the fine for a motorist who opens a vehicle door in a bicyclist's path, known as "dooring" a bicyclist, would increase from $500 to $1,000. Third, the fine for leaving a vehicle door open in traffic would double from $150 to $300. If they are sharing the roadway with vehicles, cyclists must obey all traffic laws, including yielding to pedestrians, stopping at traffic signals and indicating when they are making turns. When the traffic laws are obeyed, everyone is safer. By increasing the fines for failing to obey the law, cyclists will behave more responsibly, increasing safety and encouraging others to ride bikes." Mayor Emanuel also announced today that he has launched a sticker campaign to remind Chicago's taxi passengers to look for bicyclists before opening their vehicle doors. Stickers designed by MINIMAL design studios stating "Look! Before Opening Your Door" will be placed in the rear passenger windows of all of Chicago's taxicabs. MINIMAL became involved in the campaign after one of its employees was killed just last fall when he was hit by a semi-trailer after he swerved on his bicycle to avoid an open car door on his way to work. Mayor Emanuel campaigned for office on a promise to make Chicago a more bicycle-friendly city. Since taking office in 2011, Mayor Emanuel has dedicated millions of dollars to installing more than 200 miles of on-street bike ways in the city. As a result, bicycling traffic has increased at a rapid rate while motorists and bicyclists are still adjusting to sharing the roadway with one another. It's not so much bikes vs. cars vs. pedestrians. Unfortunately, there's a percentage of the population that travels recklessly -- whether it's on foot, on bike or driving a car. The Active Transportation Alliance supports increased traffic fines as an important way to improve safety. 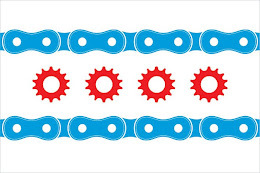 The Illinois Bicycle Attorneys at Keating Law Offices strongly support Mayor Emanuel's proposal based upon their belief that increasing safety for bicyclists requires a conscious effort on the part of both motorists and bicyclists. Affording bicyclists the same protections as motorists also requires subjecting bicyclists to the same responsibilities as motorists. In 2012, there were approximately 1,675 bicycle accidents in Chicago, including 250 accidents where bicyclists were "doored" by motorists. The attorneys at Keating Law Offices have negotiated favorable settlements for a number of bicyclists injured in the Chicagoland area, including several who have been "doored" by motorists. Doorings have become nothing short of a vehicular plague on Chicago's bicyclists. The fear of a large traffic ticket will ideally act as a deterrent to motorists swinging their door into traffic without looking first. The Illinois Bicycle Lawyers at Keating Law Offices are proud to represent and advocate on behalf of Chicago area bicyclists after a collision occurs. Part of our advocacy is promoting policies that protect bicyclists. That is why we fully support legislation aimed at preventing many of these tragic accidents before they occur, even if it might also mean more traffic tickets for bicyclists. We anxiously await the City Council's decision regarding Mayor Emanuel's proposal.